A breathtaking work of precious metal minting, highlighted by a core of lustrous, genuine Mother of Pear, this imposing, exclusive tribute to aeronautical pioneer Count Ferdinand von Zeppelin (1838-1917) and his creation of the rigid airship – universally known as 'the Zeppelin'. Inspired by hot-air balloons whilst serving as a volunteer for the Union Army during the 1861-65 American Civil War, von Zeppelin spent several decades refining his vision of a rigid airship until, in 1900, the first successful airship was launched – the Zeppelin LZ1. Used for both military and civilian transport, von Zeppelin's important invention had safely transported over 34,000 passengers on more than 1,600 flights by 1914. Unique, dramatic and imposing, this exclusive legal tender coin forms an inspiring, innovative celebration of a truly Golden Age in the history of aviation. Struck to the height of Proof quality from a massive FIVE TROY OUNCES of .999 fine silver, and measuring a gargantuan 65mm in diameter, this spellbinding legal tender $50 coin is perhaps most notable for the large, authentic Mother of Pearl insert. Glistening with iridescent beauty, the Mother of Pearl carries a stunning design, with one of the most famous German airships, the Graf Zeppelin, portrayed above New York as it completed the first trans-Atlantic commercial passenger flight in 1928. 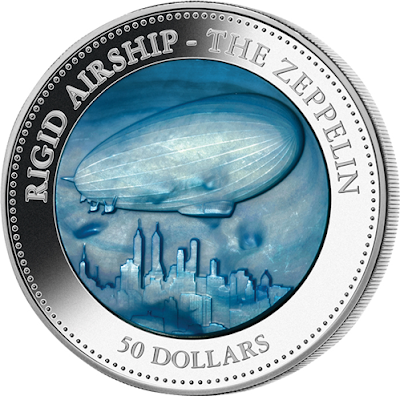 As with its predecessor, the stunning 2012 $50 Titanic Mother of Pearl 5oz Silver Proof, the tiny worldwide mintage of the 2013 $50 Zeppelin 5oz Silver Proof was instantly devastated by demand. With our allocation strictly limited, and no chance of securing more stock, this pioneering precious metal Proof will be available for a short time only. Do not miss this exclusive opportunity! Supreme example of the latest in modern minting – features a genuine Mother of Pearl insert! Struck to flawless Proof quality from a whopping FIVE TROY OUNCES of pure, prestigious .999 silver! Over 155 grams! The worldwide mintage has been restricted to a mere 500 coins! Already sold out! An official legal tender issue – measures an expansive 65mm in diameter!